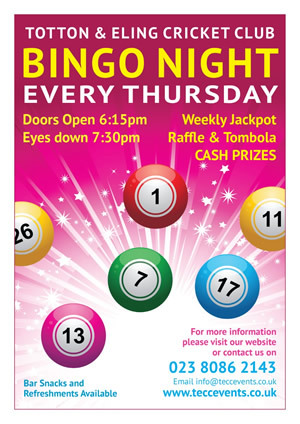 Cash Bingo every Thursday evening in our large Function Room, come along and join in with the FUN! The doors open at 6.15pm for eyes down 7.30pm. Bar Meals and Refreshments are available to purchase, and we also run a weekly Raffle & Tombola! This is a non profit event with a small percentage of ticket sales donated to Totton & Eling Cricket Club, the remainder is paid out as CASH Prizes!